But because they’re too spiteful and were determined to destroy Daniel’s career, they’re working hard to find fault and trapping Daniel. Finally they found the way and then said, “We shall not find any charge against this Daniel unless we find it against him concerning the law of his God.” (Daniel 6: 5) The next plot was, they establish a royal statute and a firm decree with the content is: “whoever petitions any god or man for thirty days, except to the king, shall be cast into the den of lions.” (Daniel 6: 7) Then they immediately went to the king to ask him to sign the decree and finally the decree signed! When Daniel heard about the new decree, was he afraid? Was he stopping to pray? Not at all! Daniel didn’t flinch, didn’t worry! Daniel made no attempt to escape or pretend to not praying. 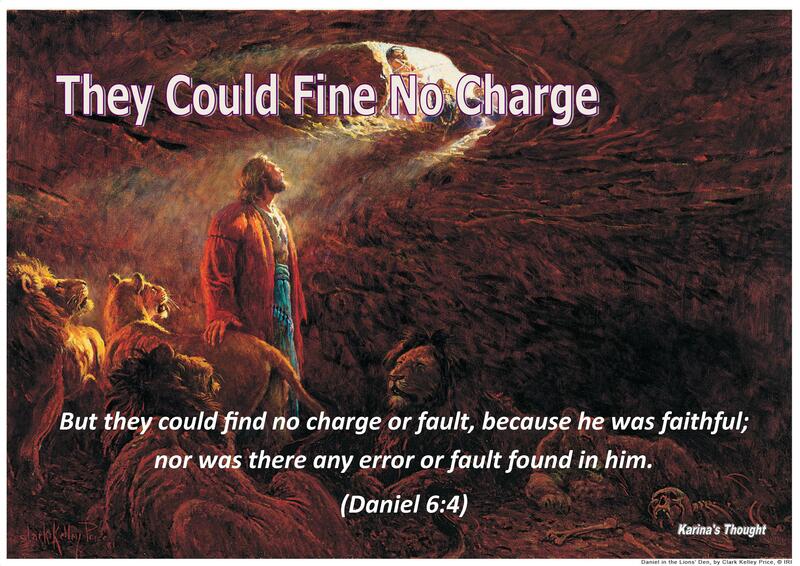 Daniel didn’t pray furtively. What Daniel did was describing a remarkable step of faith. Daniel survived because of his faith. In all respects, including when he was having problems, He didn’t rely on his own strength to overcome it. He didn’t choose to flee, or seek misguided completion alternatives. When the trouble comes, Daniel came to God. He remained calm, and prayed to God. When he was about being harmed, he remained believe with firm faith in God, even he gave a remarkable testimony on an awesome and amazing God’s power. My dear friends, God can deliver us from anything, even the most impossible thing according to human logic. Our God is fearfully and wonderfully God. When faced with the problems, slander, and being framed by the people who controlled by envy, don’t be afraid and worry. Let’s come to the Lord and pray. Ask for wisdom. God will always hear His children that pray earnestly. God will give us strength to overcome our problems. Therefore, God’s love and greatness will be shows wherever we are and we could be the light that shine and bless many people even our enemies. Amen. By infinity love God came down to the world to save humans. From the outset His hand reached out waiting for us to accept Him. His great plan has been prepared for each people who willing to surrender to Him. There is no one that “simply” salvaged but each people are given the honor to work with God on this earth. His plan is not ordinary plan, yet a terrific plan which is not affordable by the hand and human existence, EXCEPT when we willing to walk with Him! Not just to walk together, but hand in hand and AGREED with Him. Like one yoke on the two oxen’s shoulder… Without a deal, two people cannot walk together and achieve the goal, because it will tug of war between the two interests. Amos, the Prophet speaks of the God of Israel. That verse is not just about the relationship of man with man, but the image of God and man walk together. We will never be able to walk with God if we do not agree with him. 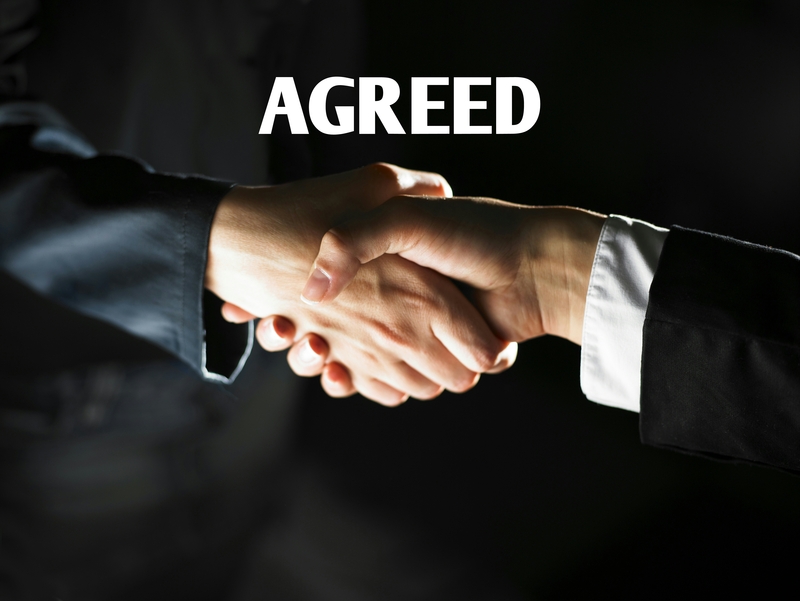 Agreed with His mind, agreed with His heart, agreed with His ways, and agree with His objectives. That means we have agreed with the whole His word. Agree with God means always say yes and no arguing (contend) with His word. When we do not do His word, that’s when we do not agree with him. When we act out of His word, that’s when we’re arguing (contend) with Him. Agreed with God means always be obey to Him no matter the conditions! Indeed it is not easy for people have full of limitations and weaknesses. But there is ONE INFINITUDE WAY WITH GOD… THAT IS FAITH! If we want a life above average, let’s walk with Jesus. But, often His way is not the same as our way. Often our brain cannot understand His ways. His truth is always contrary with the world concept, but we must continue to be in it without compromise! That’s why we must have faith.. Without faith, there would be no meeting point between God and us. Without faith, no one is able to walk with Him. His plan is too magical. His ways is fathomless. His mind is immeasurable. Walk with God means live by faith. If we want to walk with Him, let’s prepared to believe and trust to His guidance. Not easy, but not too difficult, because God never leaves us to fend for themselves. He is with us, in us. Our part is to be always agrees with His word. Enoch, Noah, Abraham, Moses, the prophets, apostles and followers of Christ are faithful to the end, are the ones who agrees with God. They catch the vision of God and totally give themselves to live in it. They walk with the Lord faithfully though the world often opposed. Their faith is proven by obedience in their every action. Faith is not just a “sense of trust”, but faith is always accompanied by concrete actions, because our works are evidence of our faith. How can they catch the vision of God and are fully confident to stay in it until the end?? Because they do not simply have knowledge about God, but they live in intimate fellowship with God in their daily life. That’s supposed to be as close and as intimate our relationship with God. But our intimacy with God will be not established if we do not accustom and train ourselves to interact closely with God. They both were very thirsty for fellowship with God more than his contemporaries and God responded by use their life in unexpected ways. God wants much closer to us compared to we want to know Him. When we seek God wholeheartedly and says “yes, I do” to Him, God will impart His power and change us until we have the capacity to be the doer of the divine plan of God. Only people who know God that can be His co-worker because to walk together with Him need agreement and unity in all things. If we don’t know God so we will not know His “language”. Without the same “language” we will impossible to understand each other. If not understanding each other will be impossible to agree each other. What is God’s “language”? How God speaks with us? The answer is through His word. God never acts contrary to His word. Because it is very important for us to diligently read, contemplate, and do His word. When we faithfully abide in the God’s word, then our sensitivity to the Lord’s voice will be more refined, our minds will be renewed, and our hearts will be more aligned with God. Thus, the easier it is for God to direct us according to His will! Our agreement with God begins when by God’s grace we open our hearts to receive Jesus as Lord and one and only savior. That’s the first step of our faith with the seed of faith that comes from God alone. Surely we are being welcomed His outstretched hand. It is our first step of walk with the Lord and begins to enter to His plan. Keep moving, don’t stop, don’t turn, and don’t turn back! The first step is the beginning of everything, but we cannot stop and be satisfied until there. If we want to continue to grow in God, so we must have the continuously willingness as when we have opened our heart to invite the Lord Jesus come into our heart. Continuously willingness to leave all of ego, seeking personal satisfaction, sin and worldly pleasures. Also willingness to always obey and formed by God until we will in the image of God. We cannot continue to be the spiritual baby. We must grow to be adult, puberty, and is ready to become the bride of Christ. Only people who have grown that can be trusted well by God. Continue to agree with God by constantly obedient to His every word. Many people want to know God’s will, but did not want to obey. Many people want to hear the voice of God, but do not regularly read God’s word. CAN NOT! As the two persons who continue to closely communicate intensely, the longer they “language” will be the same, their thoughts and perspectives more aligned, and then they are more able to reach an agreement. So it is between us and God. If we understand “His language”, then we will be understand His heart, easily capture His vision, and easier to understand of His every instruction. God does not force us. God is looking who are willing. Obey and do all of God’s will in willingness, then every our step of obedience will bring us to achieve the fulfillment of His plan for our lives. May the strength and wisdom of the Holy Spirit will sustain us, so that we remain firm and able to remain faithful to all calls and tasks assigned to us resolved definitively, according to His will. Amen.